Oh, how I’ve come to love my little nutrient dense chia seeds. They’re a great addition to many dishes, but perhaps best utilized in gel form to provide that signature smoothie creaminess. This ancient seed is making a resurgence of sorts due to its myriad health benefits and versatility. Unless you’ve been living under a rock for the past decade, you know how important omega-3 fatty acids are for your health. Chia seeds are very rich in omega-3 fatty acids, and contain more than flax seeds. Chia seeds are also high in antioxidants, a characteristic that allows them to enjoy a long shelf life, unlike most seeds. And that’s just the beginning of what this superfood has to offer. Weight Loss: Dense, filling, low in calories, and help cleanse out old buildup in your intestines. 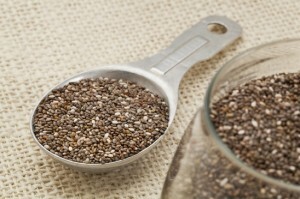 Increased Energy: Athletes and Mayan warriors have consumed chia seeds for centuries as an energizer. Supports Brain and Heart Health: The essential fatty acids in chia are great for both your brain and heart. Anti-inflammatory: Omega-3 fatty acids help lubricate your joints and keep them supple. Arthritis suffers have reported less pain after consuming chia seeds for a couple of weeks. Blood Sugar Stabilizer: The time in which complex carbohydrates are digested and assimilated is slowed down by chia seeds. Detoxification: Chia seeds absorb toxins while passing through the colon. Besides smoothies, the versatile chia seeds can be used in spreads, salad dressings, ground and mixed with flour for baked goods, or simply sprinkled in yogurt, salads, and cereal. Lately, I’ve been using a chia seed gel for my smoothies. To make chia seed gel, simply mix about 1 part chia seed to 1 part water in a small container. The gel will be ready in about twenty minutes. Store in the fridge and use in your smoothies for the next couple of months. A lot of smoothies call for banana to provide thickness and creaminess. If you want to take a “banana break”, chia seed gel is an ideal substitute. This basic version of this smoothie is pretty simple, feel free to incorporate any of the add-ons I have listed below or anything else that sounds good to you. Enjoy! Add all the ingredients into your high speed blender and blend for around for 30-45 seconds or until the desired consistency is reached. Please leave a comment below if you try this chocolate chia seed smoothie. Happy Blending! I have reciently started using chia seeds for my asid reflux, it’s great what a great relief. Hi Lucilla, chia seeds help with acid reflux, awesome! Thanks for sharing. So this was amazing! I substituted cacao for carob powder for cacao powder, blue agave syrup for honey and added 1/8 tsp of bee pollen. I indulged in all the add-ons except fruit and it was Super yummy! Thank you! Keep the recipes coming! Hey, so I’m going to try this in the morning. Is it possible to sneak in a cup of spinach without it affecting the taste? Yes, a cup of baby spinach should be barely noticeable. Enjoy! Is this filling enough for a meal-substitute? Yes, this is filling enough for a meal substitute, for most people. If you aren’t satiated trying using 1/2 avocado. Can I omit the avocado, or substitute (what)? You can simply most the avocado or substitute with 1/2 a banana or 1 tablespoon of peanut or other nut butter. What amount of chi seed gel is best to use? There are so many more seeds in 2 tablespoons of dry seeds vs the gel, I would think you would have to use more than 2 tablespoons of the gel. Am I off track here? For most smoothies, 1 tablespoon of chia seed gel is good, for this smoothie, 2 tablespoons. I don’t want to confuse people with different measurements for gel verse just the seeds. More precise measurements would be 1/2 the amount of seeds to gel. Enjoy! Hi there,thanks for the great receipes I must try the b12 smoothies cause i really need it since I’m a vegan,thanks once again really appreciate it. Will it work with cocoa vs cacao? Yes, cocoa will work just fine. Wow! First chia smoothie ever and I think I’m hooked 😉.